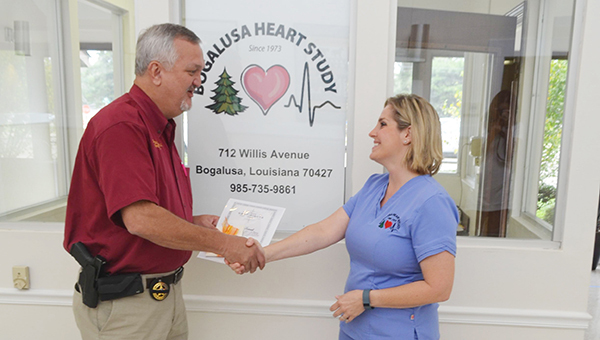 The Bogalusa Heart Study recently had its landmark 1,000th follow-up study participant, and doctors hope to hear from many more. The Bogalusa Heart Study began in 1973, as more than 12,000 children and adults in the Bogalusa area were examined in school to determine their overall health. Many of those children were examined later in life as they began to age, allowing doctors to see the role that diet, exercise, smoking and other factors played in overall health and heart health. John Sumrall, who now serves as the marshal for the city of Bogalusa, was one of the children initially tested back in the 1970s. He is also the milestone 1,000th participant in the main clinical follow-up study. Sumrall said that the study involves a number of tests, including bloodwork, an EKG and an echogram. Doctors also study his reflexes, memory and some physical activities. Dr. Lydia Bazzano, principal investigator for the Bogalusa Heart Study, said that doctors are seeking anyone who has ever participated. Bazzano said there a variety of ways to participate in the follow-up study. Anyone who has ever participated before, even just one time as a child, is eligible to answer a 20-question survey over the phone and receive $25 as compensation for their time. Any women who participated are eligible to receive up to $55 for phone survey responses. In addition, some follow-up study participants may be eligible to have free blood tests to check for diabetes and high cholesterol, and a free sonogram of the heart to check for problems related to heart disease. Those who participate in the clinic study receive $75 in compensation. Sumrall said that there is a history of heart disease in his family. His mother has had two heart attacks, and other family members on his mother’s side have had heart problems as well. His sister, who is three years younger than him, also participated in the initial school study. Bazzano said the study’s data and findings have impacted heart health research all around the world. “For example, the U.S. preventive services task force guidelines, which most U.S. doctors follow, includes Bogalusa data to provide the evidence for recommendations on when to test blood pressure in children and young adults,” she said. Those who are interested in more information about the follow-up study can call 985-735-9861.